I'm rather pleased with how the colors turned out. Soon as they dry, I'll run them thru the drumcarder and start spinning. lol! 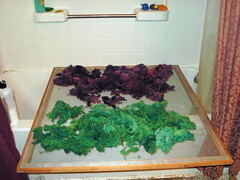 when i was scrolling quickly through my bloglines, i saw your beautifully dyed yarn & thought it was cabbage, washed & laid out on the table. all i could think was, "how did she get the green cabbage so green?"!! LOL! It did turn out *green*, didn't it? uhm, V that is VERY lovely colors!! I STILL WANT 'EM!! Y'know, if you'd take up a fiberart...like knitting, or crochet, or, dare I say it...Spinning, you, too, could have fun with dyepots and cool colors. I've already got needles. Teach me you must. Weaving I've already tasted and the loom is... erm, well, no space for it as of yet, but one WILL be in my future.